We’re excited to show you some of our recent Orlando retail sign projects, and to help you understand the unique value Citrus Sign Studio offers retail stores, as well as other businesses! Citrus Sign Studio was born from owner Aaron Lake’s love of marketing. He opened Citrus Sign Studio as a way to help businesses effectively advertise in order to stand out in Orlando’s crowded marketplace. Our mission is to create unique experiences that make your store, restaurant, or business memorable to potential customers. Signage is a highly visible way to tell your story. Drawing on over 15 years of marketing experience, we take your marketing goals seriously and work with you to develop and recommend signage that will attract new customers – we help your business flourish. You want retail signage that drives new business through your doors and keeps your current customers coming back. We work with your brand and marketing goals to create stunning, creative signage designs for a comprehensive brand experience. Creating a winning sign means understanding your ideal clients and developing a written or visual message that appeals to them. If you have ideas, we are always willing to help you bring them to life, and find the most effective sign solution for your retail business. 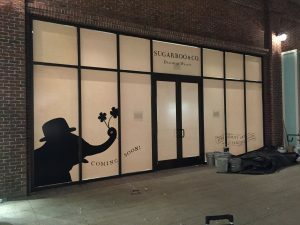 The under-construction signage we created for Sugarboo & Co. is a great example of how we can design striking retail signage for Orlando area businesses. This creative signage tells customers about the company that is coming soon, and embraces their messaging of, “Fine quality art and fanciful goods.” It tells potential customers something about what the store will offer and provokes curiosity. Thinking about window signage that can go up while your retail store is under construction? Don’t let customers think you’ve closed down. 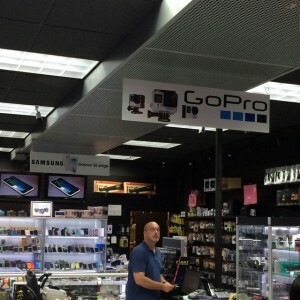 Learn more about our retail signage work for Sugarboo & Co.
Electronics City’s GoPro and Samsung signs are examples of eye-catching interior point of sale retail signs that we can create, advertising specific products. Electronics City wanted to feature these product logos strongly on the sales floor. These signs will draw customer attention from almost anywhere in the store. 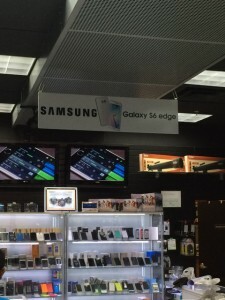 We are your expert sign company for any of your Orlando area retail store’s needs. Our retail signage ranges from decals and wall graphics to window displays, digital signage, and more! Are you ready to talk about your retail sign project? Get a free quote today.